Happy Monday friends!! So Monday’s are the worst, right? Well I have a HUGE giveaway for you guys! I paired up with the amazing Elaine Turner for a luxurious $500 gift card giveaway for Mother’s day! Every mama needs a glamorous pair of heels, a well made bag & a dress that makes you feel like a million bucks. I’m in love with this head to toe look from Elaine Turner! You wear your hair fabulous! How creative! That looks great and fun to wear. I adore this look!!!! So adorable!!! I’m new to this brand and love it! Want everything on the site! Totally in love with this dress! 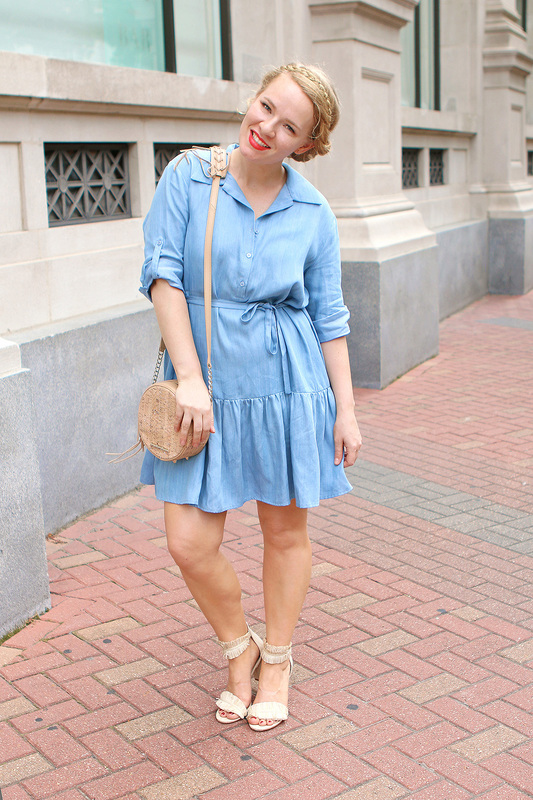 It’s a nice twist to a traditional chambray/denim dress! Well thank you for such a great giveaway right on time for both my birthday and mother’s day so I really hope to win it, Pam. It would be perfect. I love your look head to toe, Pam. It is flawless. All those designer pieces are gorgeous but I am particularly loving the dress and shoes (though such a cute bag too). Also your braided crown with a bun on the back is feminine perfection. You are such a chic mom! My brand-new linkup this week will go live tonight at 8.00 PM Eastern! You can find it on this post (below). Welcome by and share your awesome style with me and my readers. Thanks! What a fun, summery dress! And it looks great on you! Those are a perfect sandal in neutral to go with so many outfits! Love the blue dress! True summer blue outfit that I would love to own! I love the dress! I like the Isabel dress as well! Looks amazing you look great and wear that well!!! thanks for the chane towin! That is a very pretty dress and love those super cute shoes too!